Perhaps no project highlights the "what's different scares me" mentality of fanboys than WB's The Batman cartoon in general, and its take on the Joker, specifically. When the preview images for the show were released, you couldn't visit a Batman message board without seeing complaints about how "the Joker is supposed to be suave and psychotic, not an albino dreadlocked monkey in a straitjacket!" It was the TRUKK NOT MUNKY of a new generation. But were the complaints entirely unfounded? 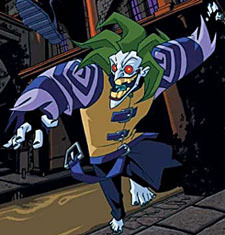 The arch nemesis of the Batman, Joker is a maniacal harlequin whose bizarre appearance and unerring instinct for the absurd have earned him a reputation as "the most dangerous criminal in the annals of crime." For Joker, each transgression he commits is an elaborate joke in which he tries to leave his victims dying with laughter - literally. More than any other enemy, Joker becomes inextricably linked to the Batman, as the crazed clown's plots begin to take increasingly more personal tolls on our crime fighter. Admittedly, Jeff Matsuda's design for the Joker was a fairly large departure from the classic look. The wild hair, the bare feet, the tattered remains of a colorful straitjacket... it was a far cry from the purple suit of the comics. 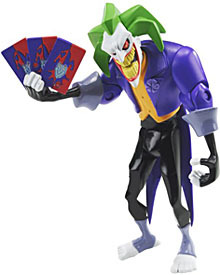 However, looking to appease those fans (or, let's be honest, to throw them a bone), Joker did eventually don a more traditional outfit, and Mattel got that figure into their toyline as Card Attack Joker. The design seems to be a compromise between The Batman's Joker and the Joker we're all familiar with from the comics. He still has the angular face, the crooked teeth, the crazy anime hair, the squared off phalanges and the hunching posture. He's barefoot, but wearing spats. He's got black pants, a yellow vest and that unmistakable purple suitcoat with a flower on the lapel. At a glance, this is instantly recognizable as the Joker, and that's really all anyone was asking. 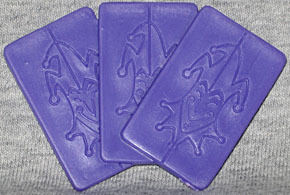 The "Card Attack" in the figure's name comes from his only accessory - a set of three oversized cards, molded as one piece. The figure isn't really sculpted to grip the cards, so the best you can manage is to rest them gingerly in his up-turned right hand. With a name like "Card Attack," you probably expect the figure to have a spring-loaded action feature, maybe to throw the cards at Batman or something. Does he? No. The figure moves at the neck, shoulders, elbows, waist and hips, but they're all normal joints. No balljoints in there, but no action features, either. That's... really unexpected. And odd. Joker's hair tops out at about 5". 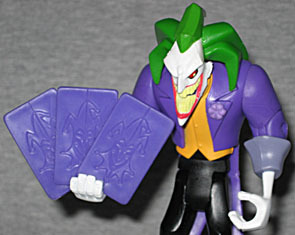 The first promotional photos of this figure and the sample shown at Toy Fair '06 showed him with black fingerless gloves and several paint apps on his playing cards. The sculpt is all still there, but the paint got ditched somewhere along the line. They'e both easy fixes, though, if you so desire. There's one problem, however, that isn't so easy to overcome. Mattel's famously awful distribution. This figure is part of the EXP subset, which means it should have been out in the summer of 2006. Here we are a year later, and I'd be willing to bet that you've never seen one of these in person, let alone seen one hanging on the peg at your local store. He's so rare, in fact, that a quick eBay search reveals not a single sample has been offered there at any time in the past three months. If not for this one, I'd have guessed that the release was canceled. Come on, Mattel! This is the Joker! Easily Batman's most popular enemy. This was the first time he was available in a "recognizable" form in the The Batman line; he should have been plentiful. Everyone filling their own Arkham Asylum was absolutely going to want this one, but he's rarer than hell. 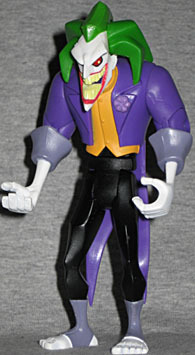 The mold is being repainted as "Smile Style The Joker" in the ShadowTek subseries, but the colors are much gaudier. It's an absolute shame that more people didn't get to find Card Attack Joker, because it's exactly the figure they've been waiting for.